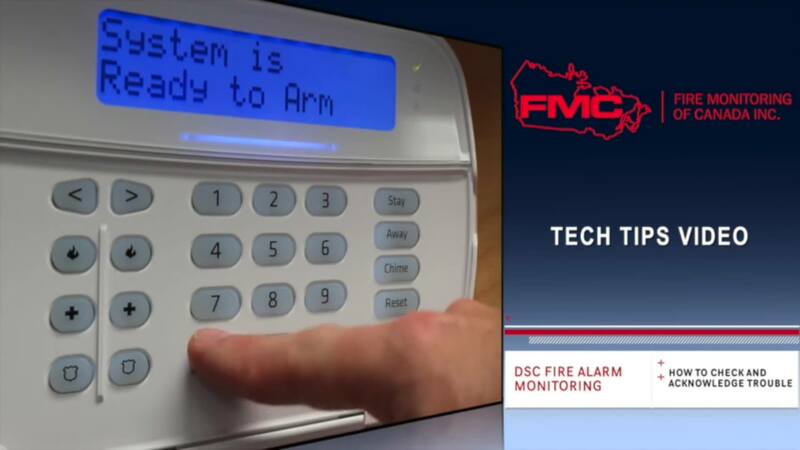 In this week’s tech tip video, we’ll show you how to acknowledge a trouble on the keypad of a DSC Power Series ULC-listed fire alarm monitoring panel. This will stop the beeping on the keypad of the ULC fire alarm monitoring panel. Click Play to find out how, or read along in the caption below the video! How to Acknowledge a Trouble on a DSC Power Series ULC Fire Alarm Monitoring Panel from Fire Monitoring of Canada Inc. on Vimeo. The DSC Power Series Fire Alarm Monitoring Panel is used to transmit alarms from your fire alarm or sprinkler system to our ULC-listed Signals Receiving Centre. The keypad on the alarm monitoring panel will show a yellow trouble light if it detects an issue with the monitoring panel. This could be any number of issues, including communication failures, low battery conditions, and more. The keypad will beep until the trouble is acknowledged. This tech tip will show you how to check to see what is causing the trouble, and then silence the beeping from the keypad. Your fire alarm monitoring panel will be red, and look something like this, with a white keypad. When you arrive at the DSC keypad you will notice that the yellow light is active, and that the keypad is beeping. Press star (*) and then 2. The keypad will display the numerical trouble code on the keypad at the top of the LCD screen. Press the # shown on the display and this will display a second number. Record these two numbers and refer to your user’s manual to determine the type of trouble currently present on the system. In this case, The system is showing a 1-1 which indicates a Low Battery condition. If you have any questions about what these numbers mean, please call our service department. In order to acknowledge and silence the trouble from the fire alarm monitoring panel, simply enter * 2 and then hit the pound key. This will silence the keypad, however the yellow light will remain lit until the trouble is resolved. If this trouble re-occurs, the keypad will begin to beep again and you will need to enter this code again. Entering these codes will not impact the function of the fire alarm monitoring or sprinkler alarm monitoring system and its ability to transmit alarms to our Signals Receiving Centre, it will only silence the keypad locally and reset the keypad. Thank you for your time, please visit our website at contact us or call us at 888-789-FIRE if you have any questions.